The latest iteration of the governor’s budget cuts $136 million from the previous version. APRN’s Alexandra Gutierrez reports. Suspense around Gov. Bill Walker’s budget started building on Wednesday. That morning, his budget director, Pat Pitney announced a budget was on its way, and warned the Senate finance committee the cuts would slash state spending by 9 percent over the previous year. A few hours later, an e-mail from the governor went out to all state employees that alluded to layoffs and acknowledged the next few months would “undoubtedly be a time of uncertainty and stress.” Some legislators even stayed up until midnight, hoping to see the document. Agency spending details finally dropped at noon on Thursday. The proposal identifies more than 300 positions for downsizing, with a quarter of those jobs coming from the university system. The Department of Corrections loses $12 million, with a cut to the community jails program. Grant programs and senior benefits also face cuts. At a press conference, the governor described the decisions as difficult but necessary. With 24,000 state employees on payroll, the proposed layoffs amount to one percent of the workforce. About half of those positions are currently vacant. Members of Walker’s cabinet have discussed the potential for buyouts or retirement incentives for senior state employees, but still needs to conduct an analysis to see if that would make sense. When asked if further reductions are necessary, Walker described his budget as a starting point for legislators, but expressed concerned that dramatic layoffs could have a ripple effect through the state’s economy. Lawmakers are not expecting to have a good sense of the budget until Monday, after their finance analysts have had a chance to review the numbers. But House Finance Co-Chair Mark Neuman, a Republican from Big Lake, says they will be looking at the budget with an eye for further cuts, given the drop in state revenue from low oil prices. “We have a $3.5 billion deficit, so we’re going to go through that. So, we’re going to go through the committee process, but I would expect some further reductions than that,” says Neuman. State employee unions are trying to take the cuts in stride. Duncan adds that layoffs are not final until the Legislature passes the budget and the governor signs it, and that the union has procedures in place for employees facing layoffs. Meanwhile, groups that advocate for smaller government do not think the cuts go far enough. “We’re of the belief that the governor failed to take aggressive action in substantially reduced unrestricted general fund spending, and it is our hope that the Legislature will have the courage to do what Gov. 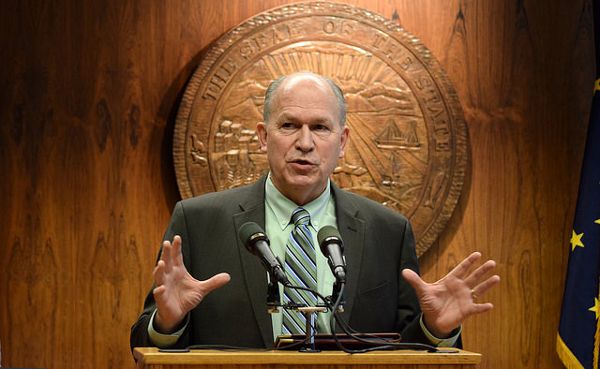 Walker refused to do,” says Jeremy Price, the state director for Americans for Prosperity’s Alaska chapter. Walker has until February 18 to finalize his budget, and says that adjustments are possible if the administration finds other potential cuts.